Issa Rae will lead the festivities at Rihanna‘s upcoming fourth annual Diamond Ball. The Insecure star was announced as the host for the fundraising gala benefitting the Clara Lionel Foundation on Sept. 13 in New York City. 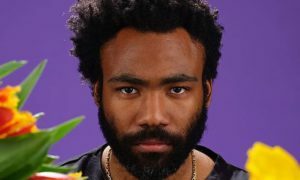 Additionally, “This Is America” artist Childish Gambino will perform during the black-tie benefit. 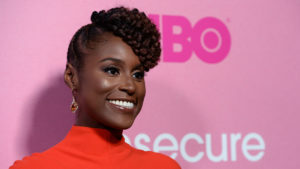 “Issa Rae and Childish Gambino were the dream duo for the fourth Annual Diamond Ball and they’re coming!!! We are honored and grateful to have them help us celebrate the Clara Lionel Foundation this year,” Rihanna said in a statement. Rihanna launched the Clara Lionel Foundation in 2012 — in honor of her grandparents — to improve health, education, arts and culture around the world. Last year’s benefit was hosted by Dave Chappelle and featured musical guests Kendrick Lamar and Calvin Harris. The 2017 event raised over $5 million to support the foundation’s programs, and boasted a guest list including Beyoncé, Leonardo DiCaprio, Jamie Foxx and more. Here’ s Rihanna’s first super hit “Umbrella” from 2007. 415,455,436 video views on YouTube. And here’s my all time favorite song of Rihanna ft. superstar Eminem from 2010. 1,576,287,210 video views on YouTube. 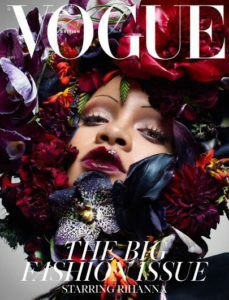 Beyoncé and Rihanna just made huge floral headpieces the new flower crowns on their Vogue covers. Here’s one more super hiy of Rihanna, “Diamonds” 2012. 1,206,896,559 video views on YouTube. The bonus track of today is a new track released in April 2018. Rihanna, Beyonce, Nicki Minaj Supergroup performing “Put It Out”. The second bonus track of today ( because tomorrow’s a holiday ) features another superstar who will appear live in concert on Saturday, August 18th, in Vienna City Hall, I wrote yesterday about him. The extraordinary artist Justin Timberlake. I wish you a successful Tuesday and come back soon with a new story about fashion & music.